Almost without exception the men and women I speak to are hard-working people, who play by the rules and want to get on in life. They work in a tough industry, have a great pride in the skills they have acquired over the years and in most cases are self-employed. However, not very many have a “Plan B”. Without the ability to do their job, they don’t have something to fall back on if something happens. 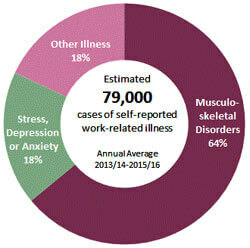 The most likely cause of being unable to work will be injury or illness – contrary to what has become a common misconception, the risk of being unable to work because of falling demand has reduced enormously. The Government’s desire to increase infrastructure projects, to build houses and to stimulate the economy means there will be years of work ahead for people who know what they are doing and get on with the job. Just think for a minute. What is your “Plan B”? God forbid, you have an accident. Your years using that palm sander means you lose feeling in your fingers and can’t hold a brush. Some muppet drops a brick off a scaffold as you are getting out of a truck and before you’ve got your hard hat on. You’re a construction worker in the trades. But deep inside, when Monday comes, your heartstrings do not play a melodious tune. Not because you’ve got a hangover. Not even because Arsene Wenger is convinced just being in the “Top Four” is the pinnacle of success and The Arsenal dropped a point or two (yet again) on Saturday. You know you’ve got more to offer. That youngster you showed how to fit a lintel last week sucked in knowledge like a sponge and it made you feel great. The Site Agent put you in charge of a team sorting out snags and took you for a pint because he was so pleased. You knew what had to be done. You told people what was required. You checked it was to the right standard. You provided a report. Those are exactly the skills Trainers and NVQ Assessors need. I quite often come across people who want to be an NVQ Assessor and they ask me what they need to do to become one. I’m always happy to help. Will you get a job if you qualify as an NVQ Assessor? The Government plan to increase the numbers of Apprentices during this Parliament by 3 million. The industry is becoming more regulated. Companies are having to get their staff qualified. The number of good NVQ Assessors is not growing sufficiently to meet demand. What qualifications will you need to become an NVQ Assessor? I always tell people the criteria I use to recruit people into SuperSkills. I always start with the Personal Skills. The right motivation – to bring on the next generation. To share your knowledge. To help develop the UK’s skills base. Diligence – the ability to do a 100% job every time. Customer awareness. Predictability. Punctuality. Reliability. The list goes on – basic employability skills. Literacy and Numeracy. As my Granny would say – being able to read, write and do numbers. Here I need to use some “training jargon”. You need English and Maths at Level 2 – which is GCSE A*-C or the equivalent. NVQ Assessor Qualification. The current qualification is known as TAQA – Training, Assessment and Quality Assurance (Click the link to see the details.) It is at Level 3 – the equivalent of an “A” Level (and you can progress to Level 4). It will take about six months. If you’re in or near Yorkshire, try YH Training Services, who deliver it and are excellent. Teaching Qualification. Don’t worry – you don’t have to get a set of leather patches for your elbows and head off to College for three years – the standard qualification is known as “Petals” – from the acronym PTTLS – which stands for Preparing To Teach In The Lifelong Learning Sector. To find a local provider, Google “PTTLS“ . A suggestion – choose carefully. Check reviews from students. There is a mixed bag of provision, but a fairly standard price. If you want to be an NVQ Assessor, you’ll be investing a lot of time and money. Trade Qualification. 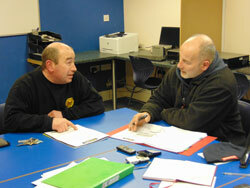 You will need Level 3 NVQ in the Trade for which you want to be an NVQ Assessor. There. I’ve said it. I know a lot of people will disagree. They say “Assessment is assessment is assessment”. Remember – I’m describing the criteria we use at SuperSkills. There are some providers that will let people do NVQ Assessment without that level of qualification. (Or even any!) We just happen to take the view that when you are assessing somebody, you need to know what you are talking about. Experience. (Lots of.) By this I mean detailed experience in a specific field. It’s got to be current. All SuperSkills assessors also practise their trade on a commercial basis when they are not assessing. We also only use them to assess their own trade. There is such a thing as a “Swiss Army Knife”, which can do everything, but I’ve always preferred to use a screwdriver if I want to get a screw done up properly. My eyes glaze over when I hear of an “NVQ Assessor” (the quotes are deliberate) who can “assess” bricklaying, dry lining, plant operations and roof tiling. Some trades go together – plastering and tiling, for example. But there is a limit. I always bear in mind the candidate. He or she will have a fierce pride in trade skills acquired over years – decades even. Credibility is essential. In my experience, trades can spot a faker a mile off. But even more importantly – people pay hard-earned money to get their qualifications and they have a right to expect the best at all stages in the process. If you’ve already got your “Plan B” – that’s great. Tick the box, move on. Site Management, Health & Safety Adviser, run a Pub, form a Blues Band, you name it. Congratulations. If not – think how you can help develop future generations of Construction Workers. Become an NVQ Assessor!